Fez is Morocco's old and ancient capital, in many ways a rival to the power and popularity of Marrakech. Its old medina is just as cacophonous an assault on the senses with its 90,000 winding streets and alleyways and in some places, medieval lifestyles. And if anything Fez is more fiercely Moroccan. This city too has an ever growing list of chic riads, and it's amongst these where you'll find many of the best places to stay in Fez. If you're here for the souqs and market the best places to stay are those within the ancient walls of Fès el-Bali - which is also the world's largest urban car-free zone. Within the medina you'll still find everything being transported by donkeys and handcarts. Don't be put off by the colour, noise, orchestra of smells and spitting camels in the medina. And also don't let anyone convince you you'll be lost within it. There are plenty of gates and once you're outside you'll easily be able to get back to wherever you need to be. Just jump in and get involved! Pick through the nicknacks and you will find hidden treasures in Fez, just remember that haggling is a way of life with these entrepreneurially spirited vendors. You can also easily eat your fill from a wonderfully enticing spread of street food. Or get a shave - apparently this is one of the the great experiences of Fez. The tanneries and dyeing pits of Fez are also a fascinating place to visit, they're right in the midst of the medina, in this case it is best to find a 'guide' to show you around - there are any number of young boys who will offer to show you. Head to the quiet, shaded madrases if you need respite. Fez also has some of he world's most treasured Arabic architecture - this city is home to the world's oldest university, so learning and historically intricate architecture are intertwined here. The best examples non-Muslims will have access to is Bou Inania madrasa, built in the 14th century and still a religious college today. But even seeing the outside of the great buildings of Fez is an experience. 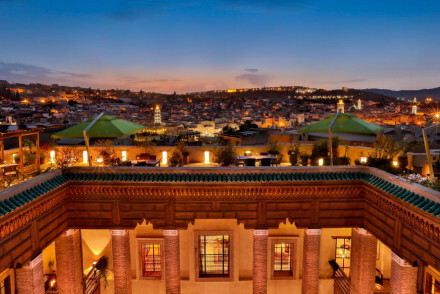 It's worth plodding up the hills around the old city for the view, or paying for the privilege of a view of the medina at the Sofitel Palais Jamai. Just remember that this is a destination which is growing in popularity, so if you want to book one of the best places to stay in Fez during the busy holiday periods, you'll need to get organised and plan well ahead. Otherwise book your trip off season, you'll find the medina much more manageable! 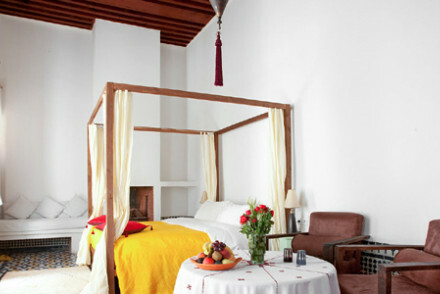 The Riad Numero 9 is a carefully decorated 18th century riad with beamed ceilings, large rugs and huge Venetian mirrors. There are just three rooms and the location is excellent so it’s quite a popular spot. Riad Fes is large and luxurious where modern decor has been blended seamlessly with the traditional to create a romantic atmosphere. There's a lovely terrace with incredible views of Fez and the Atlas mountains in the background, outstanding Moroccan cuisine and a lovely pool and spa. 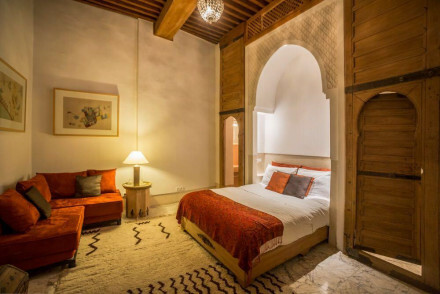 The three room Riad Al Bartal is one of the most architecturally impressive in Fez, situated in an excellent medina location. The marbled entrance hall leads through to corridors with intricately tiled floors and dark wood furnishings. The Riad Norma has a blend of French and Moroccan design including some beautiful stucco work, heavy carved furniture and detailed tiled floors. There’s a wonderful plunge pool shared between just seven rooms. 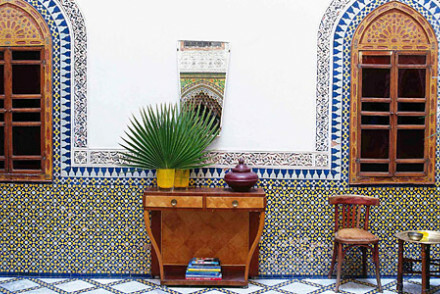 In a quiet spot, the Dar Roumana is a riad oozing traditional charm. The roof terrace is sunny and relaxing, there are some beautiful Moroccan antiques in the room and there’s a great menu. The Ryad Mabrouka is within walking distance of all the attractions of Fez, yet it’s quiet, the sunny roof terrace and pool are a great places to relax. The decor is traditional with antique furniture and ornate tiles throughout. There are just eight rooms. The Riad Idrissy is a beautifully refurbished five bed riad brought to you by the former Maitre D’ of The Ivy. The main attraction is the Ruined Garden, chef Robert’s labour of love. If you’re looking for luxury then the Riad Alkantara, with its lush gardens and five exquisitely decorated rooms, complete with antique four-poster beds, is for you. Plus they’ll really look after you. If you’re here to eat, or to learn to cook, then the Riad Laaroussa is a good choice. There are just four traditionally decorated rooms. With terracotta floors, a stunning roof terrace and a relaxing hammam - and that Faasi cookery school. 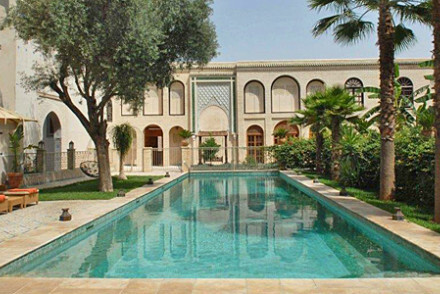 The Palais Amani is a 17th century palace converted into a grand 14 room hotel. The decor is wonderfully ornate with stained-glass windows and a restaurant popular with the local literati. 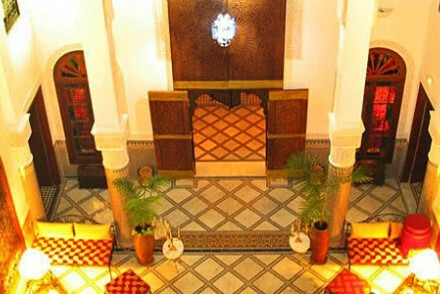 The Riad Anata is a bright, contemporary style riad in a wonderful location. There are just five rooms, each with plenty of charm. 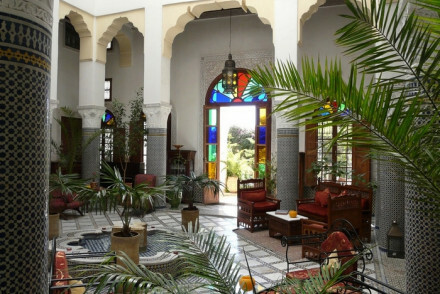 The Riad Tizwa is a old family house with generously proportioned guest rooms and elegant four-poster beds. You’re right in the medina and there’s a great roof terrace with panoramic views. 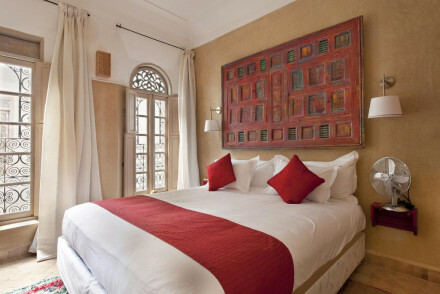 La Maison Maure is a beautifully restored riad in the heart of historic Fez. There are just six rooms, arranged around a pretty central courtyard, with traditional features. There’s also a stunning roof terrace. Rooms start from less than £60 per night. Fès–Saïs Airport is a rapidly growing airport, so check for new connections, but currently you can fly direct to Gatwick, Stansted, Barcelona, Madrid, Paris, Marseille, Toulouse, Nimes, Amsterdam, Brussels and Dussledorf, among a few other European destinations. Trains between Marrakech and Fez are cheap and reliable if Marrakech-Menara Airport might be more convenient. If you want to hire a car - which we highly recommend if you’re staying in Fez and you want to visit the Atlas Mountains - we recommend you visit our online partner Rentalcars. Fez is very hot in the summer - the maximum average for July and August is 34°C, so it’s a great winter or autumn warmth destination. If you’re basing your travel on the most pleasant weather and a lack of crowds, the best times to visit are probably during the shoulder seasons between March and May and September through November. Consider instead one of the best places to stay in Marrakech? 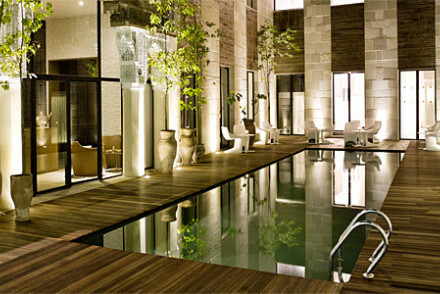 Or one of the best hotels near Marrakech? Or you could head up into the mountains and book into one of the best places to stay in the High Atlas Mountains? 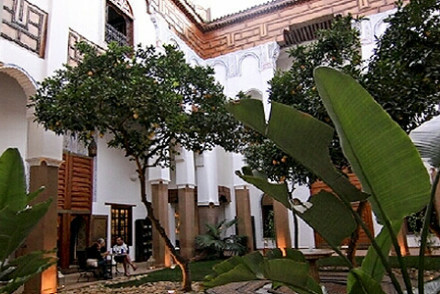 One of the most architecturally impressive this French run riad enjoys an excellent location in Fez medina. A marble floored entrance leads to intricately tiled rooms, decorated in rich fabrics and dark cedar wood furnishings. A healthy Moroccan breakfast is served as well as dinner by arrangement. 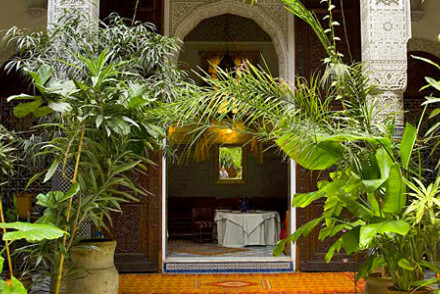 An enchanting riad perfectly located in central Fez. After a thorough renovation the feel is light and contemporary yet the building still keeps its original charm. The five rooms each feature bright pops of colour, terracotta tiled floors and the bathrooms are luxurious. A fabulous city base. Local exploring - Located in the heart of the ancient city of Fez. Find many of the city's main attractions within walking distance. Local markets - Explore the winding alleyways of the old Medina and pick up traditional arts and crafts in the many stalls. Cooking classes - Learn the secrets of Moroccan cooking at one of the hotel's classes. Sights nearby - Visit the fascinating Al-Qarawiyyin Mosque and University. Walking distance to the main attractions of Fez, whilst the sunny roof terrace and pool make this a perfect place to de-stress. A traditional riad, Mabrouka is decorated with antique furniture, ornate tiles and the blue and white palettes ubiquitous throughout Morocco. Breakfast and dinner served. 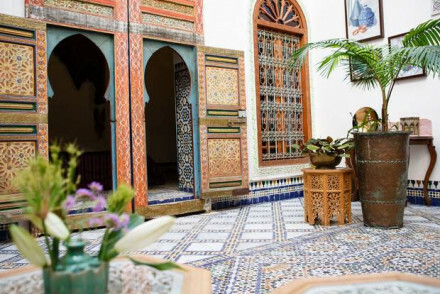 Located in a quiet spot this dazzling riad exudes traditional charm. With all the necessary modern amenities, there are no TVs but the sunny roof terrace is a perfect spot to read a book. Rooms are decorated with antique Moroccan pieces and guests can enjoy a bespoke menu. Great base to explore Fès! There is nothing old fashioned about this 18th century property. Each room is decorated with the same care as if the owners themselves were staying in them. Beamed ceilings, bright, soft fabrics, large rugs and features like a huge Venetian mirror. A designer's dream. Resto 7 is hugely popular! Brought to you by former Maitre D' at The Ivy and co-worker, this charismatic duo are a hospitality force to be reckoned with. After a painstaking six year refurbishment this five bed riad is a seemingly effortless chic retreat. The main attraction is the Ruined Garden, chef Robert's labour of love. A riad for indulgence: when not learning the art of Fassi cookery, you can relax in the popular Laaroussa hammam. Rooms are traditionally decorated with terracotta floors, wrought iron furniture and white washed walls. Take in the stunning vista on the hotel roof terrace. Ideal for foodies! Cooking classes - A cooking lesson with the riad's chef is not only possible but encouraged! A luxury riad to suit many tastes. Large interiors blend traditional decoration with contemporary flair. 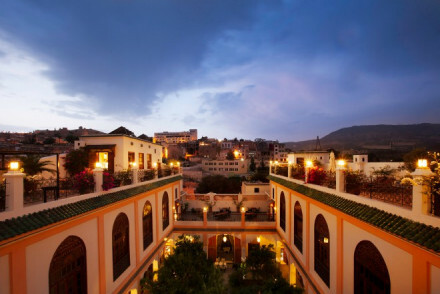 Romantic rooms and suites, fantastic Moroccan cuisine, views from the breakfast terrace, pool and spa. Stylish, gourmet, and romantic. Sights nearby - The Medina has plenty to explore. A blend of French and Moroccan design and cuisine, Norma is the perfect blend of East meet West. After its two year renovation, the French owner has maintained the intricate stucco carving and detailed tiled floors with heavy cedar wood furnishings. Its plunge pool makes Norma an great summer stay! 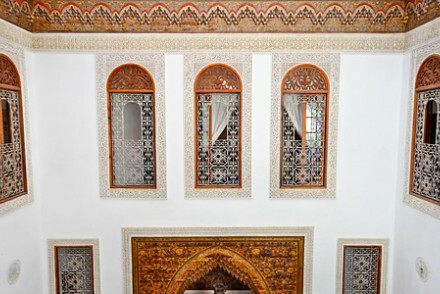 Located in Fez medina this former 17th century palace is no less grand today than it was all those years ago. The 14 rooms vary from comfortable luxury to the opulent Grand Suite in all its monochrome tiled, stained glass grandeur. There is a hammam and a restaurant popular amongst the literati. You'll struggle to find a property quite so luxurious, with as lush gardens and pool in this bustling city. Rooms are exquisitely decorated in a traditional style with antique pieces and four poster beds. There is a cultural programme that exceeds mere tourism for an authentic Moroccan experience. Sights nearby - Go to the Fes El-Jdid. Both the cemetery and the Habarim Synagogue are worth a visit. A lavish riad with opulent contemporary design. Spacious rooms feature rich hues, antique style furnishings, tiled floors and luxurious bathrooms. Serving gourmet Moroccan-Mediterranean cuisine and offering delectable fresh patisseries and tea served in a lovely tea room. Fabulous!